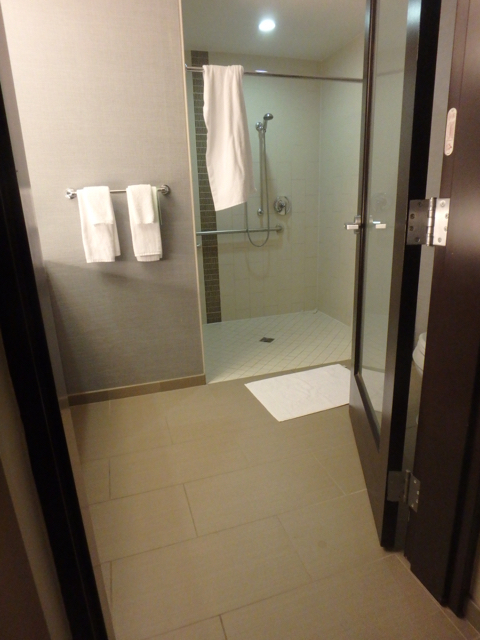 The ADA King room with roll-in shower was mostly as we've come to expect a Hyatt Place room to be like. You have the king bed and then the fold out sofa bed in the sitting room like area. The one thing, though, is only has one television. Not really a big deal, but even a standard room at most Hyatt Places we've stayed at have the bed and the sofa area a little more separate and a TV in each area. 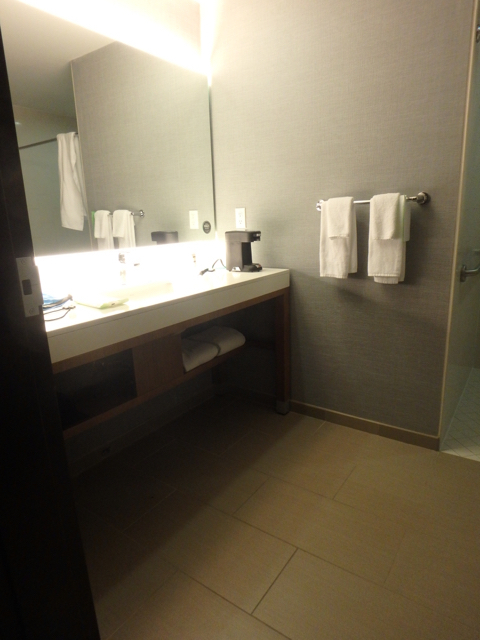 Of course, the specialty room upgrade did sort of spoil us last time. One major issue with the room was the bathroom. Sure, it has the accessible features one would expect, but it's very poorly laid out with the toilet behind the door. 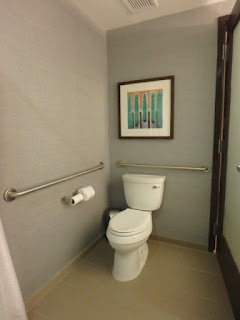 This means you have to roll the chair into the shower and then close the door to be able to put the chair next to the toilet and transfer. 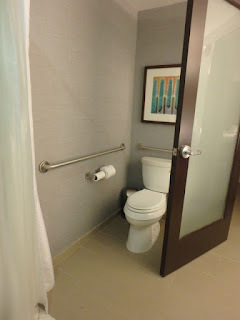 If I remember correctly, the specialty room we had last time actually had a pocket door for the bathroom, so really annoys us that this hotel does have some well designed accessible bathrooms and then also one of the worst we've ever encountered. About the only part of the bathroom Mik actually liked was the sink area as it was very easy to roll up to and use. 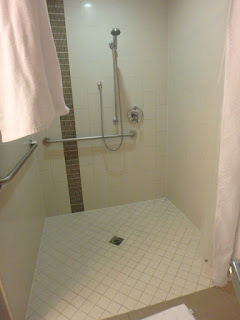 The shower was to some extent one of the best we've encountered while also being one of the worst. The good thing was it was well designed in that the water stayed in the shower and drained well. It was bad in that it did not have anywhere to set the soap. Putting the shampoo and conditioner on the ground isn't a big deal, but a soap bar turns into a mushy mess at best or gets stuck to ground at worst. Also, it does not have a seat. Now that doesn't mean they don't have them, as when we stayed in the room with a tub they had left a tub seat. We didn't ask because Mik preferred to just be on the ground anyways. The toilet and the door situation was what really made the bathroom an issue. That and the fact the toilet seats pop off very easily, but we had the same problem last time, although this time it happened way more often. Overall the room was comfortable and the front desk staff are friendly and helpful. I definitely will not be choosing a roll-in shower at this particular Hyatt Place again, though, as the awkward layout got annoying. Also, next time I will be complaining if we get such poor cleaning service again (room wasn't cleaned when we returned after 4:30 p.m. and items weren't restocked multiple days even when they did get around to cleaning it). 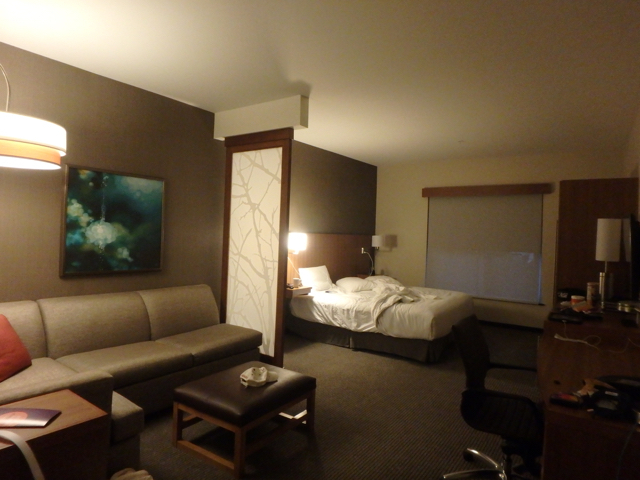 Read our more detailed review of Hyatt Place Anaheim Resort/Convention Center here.